How can Canadians invest in the S&P500? The S&P500 is a core holding for many investors. It's an index comprising 500 of the largest companies in America and has consistently delivered returns for over a hundred years. Between these two options there's several good ETFs to choose from and a variety of factors to consider. Between these three SPY is a clear loser due to its higher management fee. There are some other nuanced differences between these funds, for example SPY is a UIT, but the simplistic view of lower fees being better holds based on past performance. Between IVV and VOO I'd recommend IVV due to the increased liquidity that comes with a larger market cap. I'll return to the idea of currency hedging and its consequences in a moment, but for now let's compare apples to apples. VSP has both a lower management fee and market cap than XSP. You're likely to hold these ETFs for years if not decades, so lower fees trump a small increase in liquidity. I'll give this one to VSP. It's the same situation with VFV and ZSP, where I have to give the win to VFV. But what is currency hedging? The problem with buying the S&P500 with Canadians dollars is that you're buying companies that trade in American dollars. If the American dollar weakens relative to the Canadian dollar your investment is worth fewer Canadian dollars. Conversely, if the American dollar strengthens relative to the Canadian dollar your investment is worth more Canadian dollars. Let's look at a chart comparing VSP (currency hedged) and VFV (unhedged) over the last 6 months. We can see that the currency hedged ETF significantly outperformed the unhedged ETF. This is because the American dollar weakened significantly compared to the Canadian dollar over the summer, from a high of $1.36 CAD in May to a low of $1.21 CAD in September. But this doesn't mean that VSP is better. The American dollar could easily have strengthened during that time period. And what if the exchange rate stayed the same? In that case VFV would have done better because the MER is lower and money wouldn't have been wasted hedging against currency fluctuations. Remember that hedging costs money (albeit it's relatively inexpensive to hedge USD/CAD for institutional players). Because of currency fluctuations there's no clear winner, but we can say that VSP is a safer investment. Think of it this way: a bet on VFV is a bet that the S&P500 will go up and that the US dollar won't weaken, whereas a bet on VSP is just a bet that the S&P500 will go up. For risk adverse investors VSP is probably the better bet, but ultimately the decision depends on the long-term performance of the American dollar. Here's something else to consider: if you're willing to buy VFV and expose yourself to currency fluctuations, why not just buy the S&P in American dollars using IVV? Afterall IVV has a MER of 0.04% compared to VFV's MER of 0.08%. Furthermore, if we pop the hood on VFV we can see that its only holding is VOO - the American listed ETF! If you have access to American dollars without paying significant exchange fees (for example by using Norbert's gambit) then this argument is sound, at least before considering taxes. American listed ETFs and stocks are subject to a 15% withholding tax on dividends that may or not apply and may or not be refundable on your tax return depending on the account you're using. The issue becomes more complicated when a Canadian listed ETF owns an American listed ETF or stock. 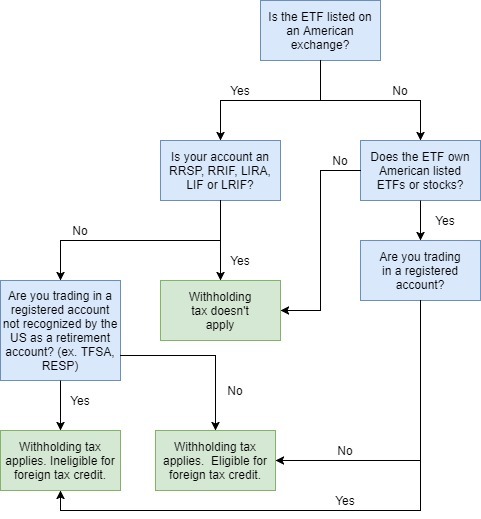 Here's a flow chart to help you figure out whether the dividend withholding tax applies. Further reading can be found here, here and here. You may also be wondering whether the 15% withholding tax is significant. The answer is yes, at least compared to the MER of these ETFs. IVV currently yields 1.74%. To find the cost of the 15% dividend withholding tax we apply the formula 15% x (yield - MER) = 15% x (1.74% - 0.04%) = 0.26%. Compared to the 0.04% MER of the ETF the effect of paying taxes is huge. In this case you could avoid the 0.26% withholding tax by purchasing IVV in your RRSP. The takeaway here is that there's no one size fits all answer to the problem, but you can rule out four of the seven ETFs and make an educated decision on the remaining three. Here's another flowchart to help you decide.